Let’s live today as though it were 1808 and we are Jane Austen vacationing at our rich brother’s house in Kent. Our days are long and filled with entertaining guests and writing letters to our sisters and eating Georgian ices, as well as ice cream, in such varied flavors as burnt filbert ice cream, royal ice cream and the most unusual of all, parmesan ice cream. When you’re little, you think that any combination of your favorite foods would be great (think Friends: “Custard, good. Jam, good. Meat, good!”) Just a little something to keep in mind as we journey through Jane Austen’s culinary landscape. So Parmesan ice cream was brought over to the UK from the Italians. Are you intrigued? I was. Cheese, good. Ice cream, good! Take six eggs, half a pint of syrup and a pint of cream, put them into stewpan and boil them until it begins to thicken; then rasp three ounces of parmesan cheese, mix and pass them through a sieve, and freeze it. As the ingredients begin to boil in your stewpan (or whatever your twenty-first century equivalent is), the wet mixture will begin to stick to the sides, like a very wet omelet. You’ll find that, by the sieving point, this mixture will actually resist sieving (try to imagine straining on omelet), but repeated banging will produce a full ramekin of the warm creamy egg-y sweet cheese liquid. Then, freeze it. Let’s hope that you had the good foresight to save chunks of ice from a nearby river or pond during the winter and store them underground in a forest of tall trees, like they did in Austen’s day, so that you will be able to enjoy this cold dessert. I recommend halving this recipe, for I could not even give this “delicacy” away. I offered it to friend after friend after friend and pretty soon, I had no friends at all. Therefore, I had to sample it myself. I approached the cold mess with trepidation. Let me put this in perspective for you: it was the first time I’ve truly been afraid of what I was eating. And I lived in Beijing for three years with a peanut allergy, so please consider the significance of the statement. VERDICT: It looked like crème brûlée, but I knew better. In short, I spat it out. At length, the cheese ice cream, while creamy and frozen, was too disgusting for me, mostly because it tasted and smelled like frozen Parmesan cheese. Mostly because it was like frozen Parmesan cheese with syrup. I do not know what the hell Regency Era people were thinking. Reader, do not make this recipe. Cheese, good. Ice cream, good. Cheese ice cream? BAD. We’ll just say that I took one for the team here, okay? Luckily, I found another Regency Era ice cream that was delightful. The best thing about this 1807 recipe is that you probably have all of the ingredients in your house right now. This means that, even if you are not Jane Austen vacationing on a large English estate, but instead, say, a hungry lady whose cupboards are bare save for stale bread, a couple of eggs, and some sugar, you can actually have ice cream! Granted, the flavor of the ice cream will be “brown bread” but beggars can’t be choosers (even Jane knew that± — that proverb was written in 1562). Besides, we like bread, right? As the recipe is from the 19th century, you do not need an ice cream maker (and if you do have one, what are you doing reading this? You have everything a woman could ever want). 150g wholemeal breadcrumbs (don’t bother to make your own bread — this is the 1800s, after all — we can buy bread). 1. 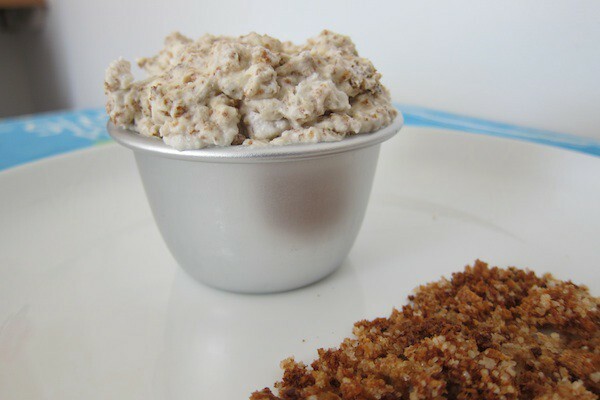 Preheat the oven to 390 F. Mix the bread crumbs and sugar together and spread onto a lined baking sheet for 10 minutes. Remove, stir and bake for another five minutes. Stir again and set aside to cool. 2. Whisk egg whites, salt and lemon juice in a bowl until frothy. Then, beat until they form stiff peaks. 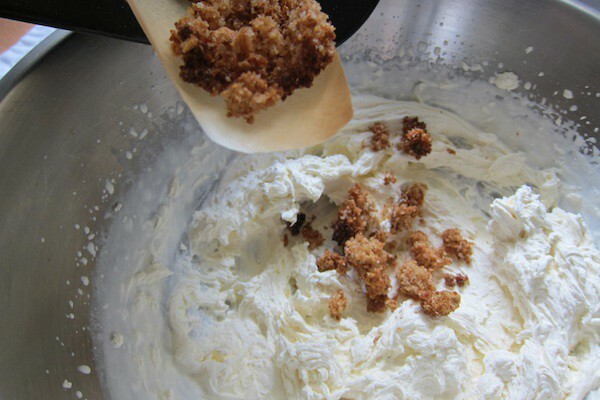 Gradually add 2 tablespoons of the caster sugar and whip until stiff, glossy peaks. Set aside. 3. Heat the remaining 60g of sugar and add 60 milliliters of water to a pan, until the sugar is dissolved and the syrup bubbles up to form a sticky mass (to test the consistency, drop a ball into cold water — if it remains solid, it’s ready). 4. Very slowly, pour the hot syrup into the egg white mixture with beaters running, until the mixture is cool to the touch (10–15 minutes). 5. 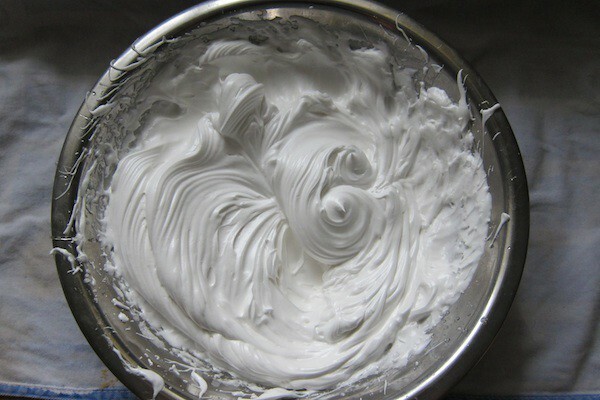 Add vanilla extract to the double cream and whip to soft peaks. 7. Divide into ramekins and freeze. Serve with caramelized breadcrumbs on the side. VERDICT: Crispy sweet frozen soufflé all made with the ingredients found in your household. The crunchy chunks and creamy meringue complement each other well. Very tasty. Super impressive. No gags. For extra fanciness, keep them cool in this French porcelain ice cream pail. Like Jane, we too, “shall eat (brown bread) Ice (cream), drink French wine (coolers) and be above Vulgar Economy” (whatever that means — at the very least, we will not squabble about who has more Twitter followers). And, no matter how religious you are or aren’t, let’s all say a word of grace before our next meal that Parmesan ice cream is not a thing anymore.